Tom Cruise and Katie Holmes, Religion and the Higgs Boson: How the World Turns — and Is Turning? Like many things in life, it depends on what you want to hear. Whether you’re a religious person and don’t believe there’s a chance in hell for the Higgs Boson to exist, a devoutly religious person that denies priests are fondling children — and concealing it — or a Scientologist that believes, after donating thousands upon thousands of dollars, your soul or “thetan” is a reincarnation that has lived on other planets before living on Earth, such as Tom Cruise, recent (apparent) scientific discoveries in Geneva, Switzerland suggest that, though we may not want to hear some things, we should question everything, but in particular, the largest, most powerful science fiction story of all — or scam, take your pick — the creation of organized religion that is the bane of our existence. Let’s begin, then, almost at the beginning. The oldest religion, dating back to the early Harappan period (5500-2600 BCE), is Hinduism. Neither the pursuit nor the attainment of the world’s visible rewards brings true happiness, suggests Hinduism. Might not, then, becoming a part of a larger, more significant whole relieve life of its triviality, after all, we all want meaning? This question alone gives birth to religion — and slowly and energetically moves from an existential question to the “opium of the people.” Without falling into the ridiculous arguments generated by ill-prepared politicians and journalist hacks, let’s just say, avoiding the term, Marxist, that Karl was right on this one. Marx actually said, “Religion is the sigh of the oppressed creature, the heart of a heartless world, and the soul of the soulless conditions. It is the opium of the people.” If we take this “Marxist” notion and apply today, we can see that if fits, it works. Name a poor community in America where you don’t hear, “It’s God’s will” uttered by people that are homeless and suffering from some institutionalized mandate, whether it’s zoning and the lack of health care and environmental degradation, and climate change and just plain old inhumanity, such as the lack of social mobility, particularly through education. Name a time that has been more heartless then our own whereby in the name of God and Allah we are separating, maming, killiing and destroying people simply because they view the world differently — or better, we need their resources and we need their strategic location from which to launch our control over needed resources. In the name of God — who we say we trust — we rob the poor, in our own country and elsewhere (the evidence is overwhelming), then give them guns, and to keep our attention busy, we fly drones over the helpless, in the USA and elsewhere. And we, the citizens of this country that says, “In God We Trust,” turn from our inhumanity to all, and we’re suppose to be the most Christian, Sunday church going, Bible pounding nation in the world. What gives? But let’s not get ahead of ourselves, not in the name of God, anyway. Let’s go back to the problem. The question of Hindiusm — and all subsequent religions — What do people really want ? — becomes fundamental in creating orthodox structures that solicit obedience through dogma meant to respond to the question. Within these tightly structured boxes — or organizations — where allegiance is mandated above even faith, there is little room for debate, let alone creative disruption. Hinduism tells us that the first thing we want is Being. We want to be rather than not be; normally, no one wants to die (Scientology has co-opted this narrative strain quite heavily). Second, we want to know. We are instinctually curious, whether you’re a scientist probing the universe or at home with the family watching the news — we want to know. In fact, we’ll turn to gossip — or reality tv — just to get the sense that we know something, anything. The third thing people seek is joy, a feeling tone that is opposite frustration, futility, and boredom. Hinduism — and all other religions — prescribe a road to this sense of joy, provided one follow a strict path. Allegiance comes first, followed by the embrace of a promise to live happily ever after in joy. If we couple these three needs to the unique human capacity to think of something that has no limits, the infinite, we can see how Christianity, which began as a Jewish sect in the eastern Mediterranean in the mid-1st century, follows. And how, with Islam, both follow the notion that there is an uncorrupted monotheistic faith of Adam, Abraham, Moses, Jesus and other prophets, all of whom, first, try to answer the question, What do people want?, and, secondly, are the vanguards of strict organizations that get formed around the prophets’ ideas, long after these prophets are dead and buried, and try to conflate material reality with a science fiction pertaining to the afterlife, edenic spaces to experience life ever after, and even reincarnation suggesting that we’ve existed before, time traveling, century after century, year in and year, living and dying and being reborn again — perhaps into Tom Cruise — while all sorts of immoral actions are being leveled against the “flocks” of these organizations — and by the most staunch believers. The latest insanity around Tom Cruise and Katy Holmes suggests that we’ve reached a pathetic end to these cloaked belief systems. Imagine the level of intelligence of people, celebreties or otherwise, that pursue a religion that was incorporated in 1953, by L. Ron Hubbard, a science fiction writer. Hubbard created a rather false universe; it followed his treatise on self-help, Dianetics, describing a metaphysical relationship between the mind and the body. But it makes some sort of sense, doesn’t it? 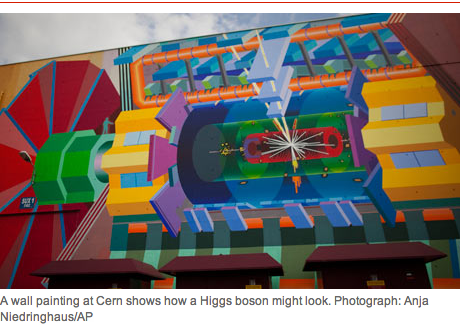 Enter the Higgs Boson apparently discovered in Geneva the other day: picture a room full of people. We’ll call this the Higgs Field. Suddenly, in comes a person, a noted person. He steps into the room and begins to mingle, shake hands and so on; people gather around him or her. The more people gather around this person, the harder it is for this person to move. Then this mass of people begins to act — or move — as one. As one, it’s slow, large, difficult to move. Then a less popular person enters the room. Some break from the mass and move to the new person in the room — or field. This person’s mass is smaller, therefore it’s easier for this person to move about with his or her group. There you have the Higgs Boson. Without it, matter would not exist — we would not exist, and I wouldn’t be writing this. 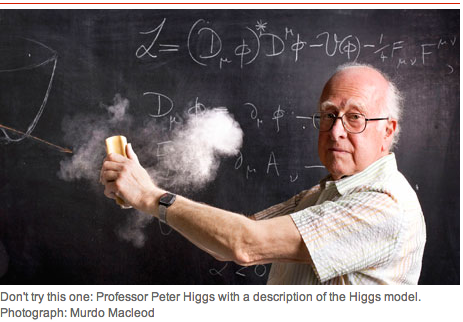 The Higgs is the foundation for matter, to put it plainly. 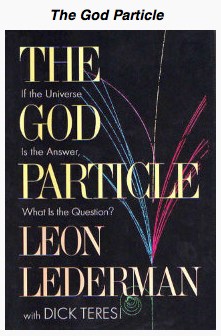 This is, apparently, the basis of the structure of the universe — and it is NOT the poorly named “God particle,” an unfortunate statement made by Professor and Nobel Prize Winner Leon Lederman that titled his book, The God Particle: If the Universe Is the Answer, What is the Question? , providing a brief history of particle physics. No other physicist or scientist has used the term as such, according to Matt Strassler, theoretical physicist at Rutgers University. If the Higss is not the “God particle,” then what it is? It is a scientific discovery, first and foremost, data that explains our being; our desire to be has a scientific explanation. Secondly, the apparent discovery comes from our curiosity, our search for answers to the most fundamental of questions, but in a scientific way, rather than a science fiction approach that has its own place in our culture (another story). Finally, the discovery begins to turn the corner for human nature’s need to know where we come from, how we’re made and why. It may even provide a road to where we’re going. This is the next story, the story to come, and it’s built on science, not on science fiction; it’s built on reason and intelligence, carefully constructed around mathematics and physics — the Standard Model — that, in turn, enable us to create fields of information that are varifiable. Stories and myths are essential for the human condition; however, these have to be used appropriately, which is not to control, mandate, influence — and then punish — as a way to find happiness and peace later, after one’s death. We can find joy and learn about each other, with science and poetics, myths and faith working in tandem, not as antagonists. The Higgs Boson calls attention to our diversity, which we are now challenged to accept and embrace. Here’s a teaser for you, finally: THE MASTER, a film by Paul Thomas Anderson, to be released soon. If you understand nothing of what I’ve said, see it in film form. This entry was posted in Class, climate change, corruption, cultural studies, Fundamentalism, Media, Muslim, philosophy, politics, Pop Culture, Religion and tagged aggression and violence, Conservative Religion, cultural studies, education, elitism, Higgs Boson, history, humanities, Katie Holmes, knowledge, Media, Myth Today, Scientology, the future, Tom Cruise by hector. Bookmark the permalink.